Potential is not some abstract your Mom and your 6th-grade teacher agreed that you had a lot of and needed to work up to — it’s physicists’ technical term for a kind of energy. Yup, the stuff that makes things happen for real and big time. System Example 2: your life. Listen up: Potential energy is very useful. It completely powers every river. And it can power your life in just the same scenic-AND-always-gets-its-way way. “But,” you might be saying, “isn’t potential a lot like intelligence in that”, as my grandfather would say, “together with 25¢, it will buy you a cup of coffee?” Of course now it’s more like “together with $2.50, it will buy you a latté,” so, yes, the point is even more vital: potential isn’t worth much unless you can put it to use. And when you’re feeling stuck, transforming your potential —-> the actual work required to build the life you want SEEMS like a leap. It falls. Toward what attracts it. The river simply feels the direction in which it’s pulled and flows there. This one rule — this one way-of-going-about-things — powers and steers everything a river does. The river’s particular flavor of potential energy is gravity. That’s why river water will waste no time getting to whichever direction feels most like downhill. Now, the higher it is above sea level, the more potential the river water has. 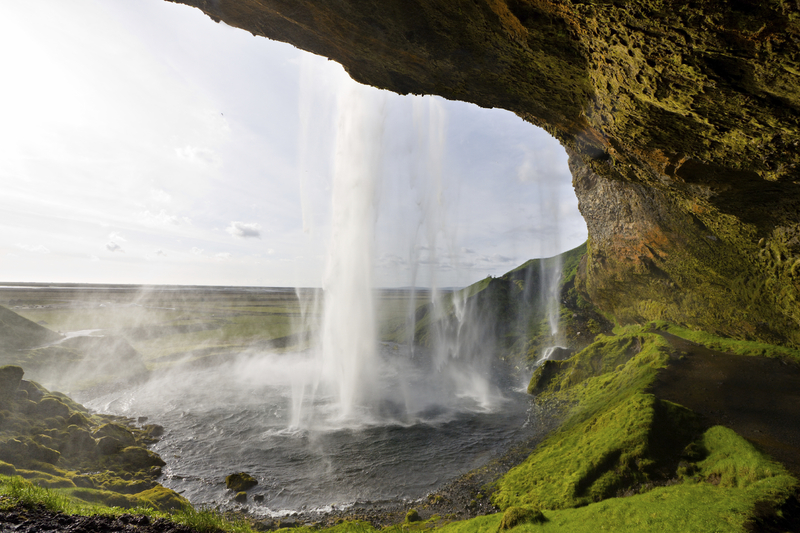 Which means that as it flows downhill — following the pull of the sea — the river’s potential energy decreases. BUT wait a second! Isn’t energy always conserved? Ah, yes — you’ve heard how energy can be neither created nor destroyed. So how can a bit of potential energy just… go away? It can’t. BUT energy CAN change form. As a steadily flowing river drops in elevation, its potential decreases, and that potential energy is converted to friction energy — in other words into energy that is dissipated against the stream bed and bank. This friction energy is called the “stream power” because its “shear stress” (I never tire of how these very technical terms get imported into our daily conversation with great meaning.) literally shears or shaves sediment from the stream bed and banks. The river shapes its channel in this way. As potential decreases, stream power increases. As it follows what pulls it, the river converts its potential into its life’s work: building itself. A river converts potential energy into its pretty, earthen stream channel: That’s why Luna Leopold ended his classic book A View of the River with the soaring, almost rhapsodizing, statement, “The river is the carpenter of its own edifice.” Of course he got rhapsodic — because it’s pretty crazy. The river is one giant self-making potential convertor. Just. Like. You. The river’s cool creative stuff gets done through things that sometimes get a bad rap: Friction. Stress. Work. All you have to do is let yourself follow what attracts you, and your potential WILL be converted into an energy that immediately starts shaping your life. This entry was posted in Uncategorized on February 17, 2014 by Betsy. Those seven words made me laugh so hard that they actually got me thinking about boundaries in a real way. (Proof that taking things lightly is miracle-inducing.) As in, where do we set them and how and… what the heck are boundaries anyway? 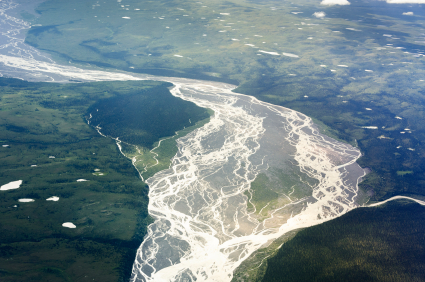 What do we know about a river’s boundaries? When hydrologists restore a damaged stream, we don’t set boundaries for the river. We just find the river’s own, already-existing, naturally-occurring boundary — “bankfull.” It’s always there. You’ll hear references to other boundary-sounding river features, for example the “low-flow channel” (but that changes annually if not daily) and the “one-hundred-year flood” (but that is a statistically-constructed theoretical estimate). Bankfull is the one and only visible physical boundary that a river has. Knowing and respecting a river’s boundary is the most fundamentally important piece of the restoration process. Only after we see and measure the river’s boundaries can we gather all the information necessary to understand “how the river wants to be.” Since basing design on the river’s innate preferences is what makes Natural Channel Hydrology so beautiful, effective, and sustainable, it is safe to say that everything hinges on understanding the river’s boundaries. 1. One way to identify a river’s bankfull boundary is to walk straight up out of the river — perpendicular to the flow — with your attention in your feet. When your toes begin to drop — to feel an even, level spot — that’s quite possibly bankfull. Hydrologists take into account that bankfull is a geological feature. 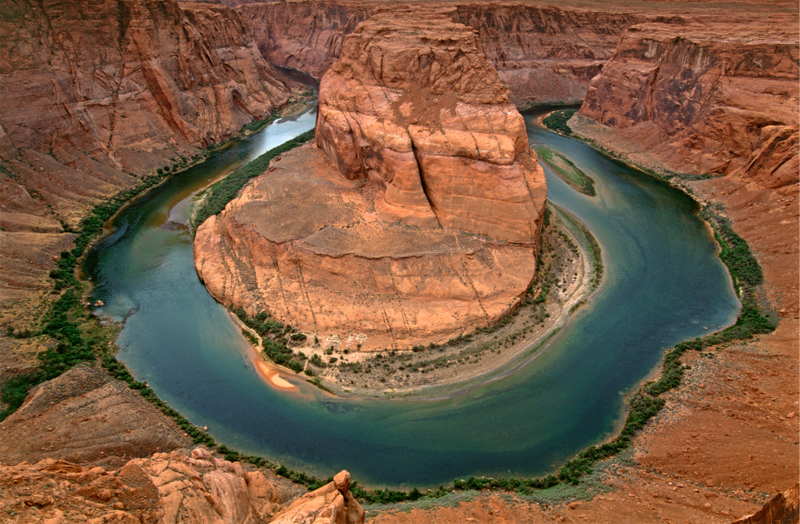 It’s a physical phenomenon within the river body — a level/depth — where the bank flattens out. It’s where the river just begins to spread out its waters when flow rises to flood levels. Start somewhere inside yourself that you KNOW is “you,” and feel your way out into the world. When you feel a flattening out — there’s your boundary. Alternately, start somewhere way outside of someone else’s private self, on nice level ground, and head toward that person’s psychic (or actual) space. When you feel the beginnings of a drop — a steep-ish slope down into their life — there’s your boundary. I decided to test this approach: when is it okay for me to know something about my (18-year old high school senior) son’s social life vs. when should I mind my own business? He’s still in high school and lives in my house, so I feel fine establishing what time I can expect him home at night. But he is an adult (! ), so I no sooner walk toward more details (like “who is he with?”) then I get a dropping in my stomach like when an airplane plummets. There’s the edge. When he was 5 or even 15, I still would have felt perfectly steady with the need to know who his companions were. Back then, I wouldn’t have felt that dropping sensation until I got to the desire to know, oh.. whether or not he ate candy (at 5 — yes I was THAT mother) or who he had a crush on (at 15 — God I tried NOT to be THAT mother but it’s harder than you might think!). Note: I also could have arrived at this conclusion by starting inside myself — I don’t feel on even-footing until I know what time he will be home. Then I can sleep. So that’s where I can stop and say — this is my boundary. 2. Whenever possible, river professionals analyze historical flow data to determine which flow/energy level does most of the real work, i.e., is the peak in 2/3 of the years. If that flow’s depth matches the physical features we see in the field, then we have a little more confidence that we have spotted the river’s boundary. Sometimes, bankfull’s physical line has been obscured (by a flood) OR there are conflicting flat places (maybe caused by periodic, artificial high flows released from a dam) OR the level area is so narrow that it’s hard to be sure if you’ve found bankfull (This is especially common in stream-types A, F, G, and even B. Click here to find out what kind of stream you are!). In those cases — and even when we think the boundary is clear — an hydrologist’s next step is to remember that “bankfull” also refers to an amount of water flow — a certain number of gallons moving down the channel each second. Bankfull is the flow that fills the channel to the point of imminent flooding. Larger flows are more powerful, yes, but they occur infrequently. That’s why river channels are not big enough to accommodate their 100-year flood. Smaller flows are more frequent, but they are less powerful. They don’t carve significantly into the surrounding earth or carry much of a load. Where frequency intersects power is the sweet spot — the flow that made the river what it is — perfectly suited to its environment. 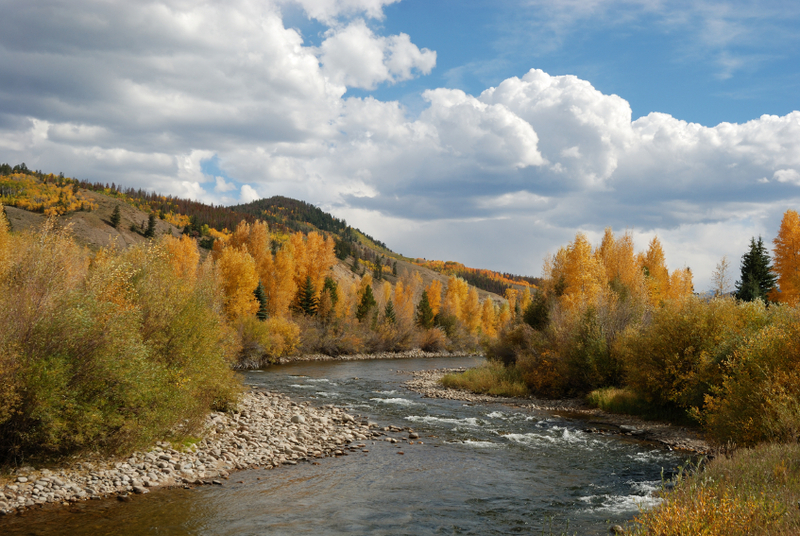 On average, a river’s annual peak flow (usually the spring runoff but sometimes a quick increase in flow caused by a rainstorm) reaches bankfull or higher in 2 out of 3 years. » I think that our true human boundaries also are associated with the real, meaty work we have done and continue to do in building ourselves to be who we are and who we want to be. Don’t be fooled into thinking your boundaries have to do with the small many-times-a-day issues like whether or not your housemates put the toilet paper onto the rollie-thing in what you consider to be the proper direction. Nor are your boundaries to be found in huge crises like whether or not your childhood best friend came to your mother’s funeral. Though such an event can cause huge damage, it’s not something you design your life around. To find your boundaries, look at where/when/why/with whom/how you do your real life’s work. That’s what matters. What has shaped that work? Or, more exactly, how have you shaped yourself into this person you want to be? Protecting and creating those situations are your boundaries. Kelly gets irritated that her husband is messy in the kitchen. And it almost killed her when he had an affair. But her real work in life — creating a family in which all members thrive as individuals as well as have a safe, relatively simple, haven together as time goes by– wasn’t formed by divvying up the dishes or by one big promise. It was/is shaped by the connections forged in engaging altogether in open-hearted conversations, fun activities, and comforting routine. Perhaps these things make up the biggest part of the day only 1/2 or 2/3 of the time, but that’s where the real work is done, and so those are her boundaries. Her husband is good at those things, so — for now — it is worth it to her to work through the tiny and monumental issues that come up. 3. Another way to identify bankfull is to look for the “tree line” next to a river. This is somewhat of a misnomer because in some ecosystems, the perennial plants actually may be non-woody deep-rooted vegetation, but you can be sure that you will not find a river’s perennial friends inside the river’s bankfull boundary. Hydrologists know that a rivers’ best friends — trees, bushes, and deep-rooted plants — need water and nutrients yet cannot live when constantly saturated. When peak flow reaches or exceeds the bankfull level, water spreads out on the flat area adjacent to the channel — the floodplain — and the water slows way down. As soon as it spreads and slows, the river loses power, soaks the ground, and drops the load it has been carrying (which includes nourishing topsoil from upstream AND seeds!). Bankfull flow is only seasonal — the river is significantly lower most of the year — so although they get regularly watered and fed by the river, plants at bankfull elevation are not drowned underwater most of the time. They have room to breathe. The best of all worlds and a truly symbiotic relationship. Trees need stream banks, and stream banks are stabilized by trees. For this reason, perennials do not survive below bankfull elevation.Annual grasses — and shoots of all varieties — sprout and grow down inside a channel for one summer, but the next one or two spring runoffs will likely drown them or wash them away. » To find our own boundaries, I think we humans can look at where our very best friends and allies — our very happiest and best version of “Everybody” — congregate. That’s where they stabilize us and we benefit them as well. And that’s where they stop, respecting our wants, needs, and preferences. 4. Most importantly, we are wise to remember that each of the above conditions can be difficult or impossible to assess. When that’s the case, river guru Dave Rosgen’s favorite on-site learning activity is to ask his students to grab their sack lunches and picnic by the river. Try this yourself: Usually you will end up parking your bottom right exactly on bankfull because a river’s boundary is the most comfortable spot — level, perhaps next to a tree, near the water but dry… and high enough to look around. » The same goes for humans: get comfortable. That’s where your real life’s work is done, and that’s your one true boundary. What if you feel your boundaries aren’t established and you really need to FORM boundaries? If you want to live like a river, then don’t worry about artificially, theoretically calculating or setting “appropriate” boundaries. >>All you have to do is: your life’s work (and remember, work and play are the same thing in the realm of physics and rivers!). When you are following your calling, your personal power automatically will carve your perfect boundaries into the foundation of your life. Not only will your bliss (as our beloved Joseph Campbell called this kind of work) form a life with edges perfectly-shaped for YOU, but also it will create a “floodplain” to absorb the excess when life’s floods overwhelm you. And that will attract a community of supportive allies. And they will grow right next to you come drought or high water, and they will support you and you will nourish them and together you will create the comfiest spot around — your boundary. This entry was posted in bankfull, boundaries, Floodplain on January 19, 2014 by Betsy. A rives never tires or ceases because it’s always pulled by an ever-present force — gravity. The earth is a hugely strong attractor. Nothing a river does can change its destination. It WILL get to a sea. And none of us can avoid the pull of love, according to the Sanskrit text quoted above. No wonder that text’s title translates to “Praise Knowledge,” for this is indeed a deep and praise-worthy thing to know. You know it by feel — from experiencing that pull, moments of falling into that sea of love*, and the cycle of emerging only to flow in that direction once more. The journey always involves beauty/messiness — meandering; erosion; friends, family, lovers, and loss; moderation and eccentricities; abrupt steps; floods. Thanks be. This entry was posted in Uncategorized on January 10, 2014 by Betsy. Play my new game! Rank these eight rivers in order of moderation. Go ahead; I will wait. So, looking back at your ranking decisions, what were your criteria? Most people instinctively do not choose #1 as the most moderate: so steep and fast and wildly beautiful. Number 7 is usually eliminated for sheer rawness, as is #4. Number 8 looks too complicated to be considered moderate. Number 6 looks rather… something. Way down there? But on the other hand it looks kind of under control, so maybe it’s moderate. Number 2 — very exciting and fun! But that’s not what we associate with moderate. Maybe #3 is the moderation star — seems so classic, after all. Before I reveal the hydrological answer, let me throw in an extra credit question: which river do you think is the most stable? And just for interest, though there is no such thing as an ugly river, what is your favorite in terms of beauty — right this moment? Only one of the above eight river types is moderate in all those areas: #2. Moderation is not the same as slow (#5) nor does it go with a classic workhorse beauty (#3). It’s not isolated and independent like #6. 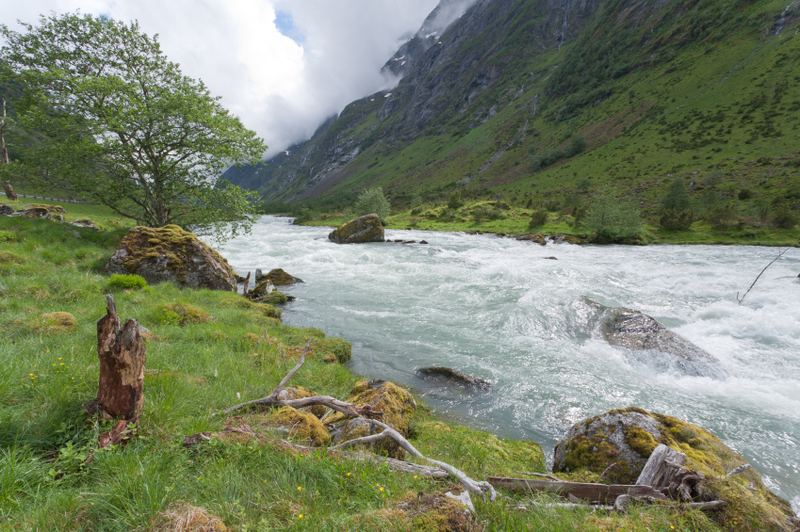 The most moderate river type is the one we call “rapids.” It’s the one river runners flock to. It’s fun — not boring even in low flow and not full out terrifying even in high flow. It interacts with its surroundings — getting somewhat wider in a flood and definitely benefiting from nice stream side vegetation — but doesn’t dominate the neighbors (by overflowing at the slightest increase in its energy) or completely depend on them (a little over-grazing or watershed paving won’t reduce its banks to raw smithereens). At least it may not be what we thought it was. It’s nothing to be ashamed of — or inordinately obsessed with in any way. But for sure it’s not dull. It’s vital and engaging. No, it’s not the only way to be well. What I love about rivers is that any type can be stable (well, except one.. and it can be healed), and they’re all gorgeous — even the immoderates. Even the moderates. This entry was posted in moderation, Stream Type A, Stream Type B, Stream Type C, Stream Type D, Stream Type Da, Stream Type E, Stream Type F, Stream Type G on September 21, 2013 by Betsy.